Artist's concept of a robot-run space transportation hub at geosynchronous orbit, about 22,370 miles (36,000 kilometers) from Earth. The future of spaceflight involves building, refueling and repairing spacecraft in a depot far from Earth, all without the aid of human hands, officials with the United States military say. The Defense Advanced Research Projects Agency (DARPA) is developing a highly capable robotic arm that could make such a space "transportation hub" possible in the relatively near future, said former NASA astronaut Pam Melroy, deputy director of DARPA's Tactical Technology Office. "Look at the great seafaring port cities in the world for inspiration, and imagine a port of call at 36,000 kilometers," she added. Thirty-six thousand kilometers (22,370 miles) is the distance from Earth at which satellites fly in geosynchronous orbit, or "GEO" for short. Spacecraft at GEO — which include most operational telecommunications satellites — complete one lap in the same amount of time it takes Earth to rotate once on its axis, and therefore appear to "hover" over one spot on the planet all the time. It makes much more sense to build a transformative transportation hub at GEO than at low-Earth orbit (LEO), which lies at an altitude between 186 miles and 373 miles (300 to 600 km), Melroy said. For one thing, orbital velocity at GEO is lower, reducing the risk of serious collisions with space junk. GEO is also a much more stable orbit, because satellites located there are not nearly as affected by atmospheric drag. Whereas spacecraft at LEO (such as the International Space Station) will fall back to Earth within 25 years or so unless orbit-boosting maneuvers are performed, objects at GEO will stay put on their own for up to 1 million years, Melroy said. "We think this sounds like a really interesting place to put infrastructure, because it's such a stable place," she said. Radiation levels so far from Earth — GEO lies about 10 percent of the way from Earth to the moon — are too high for astronauts to tolerate safely over long durations, so this future facility would be run by robots, Melroy added. 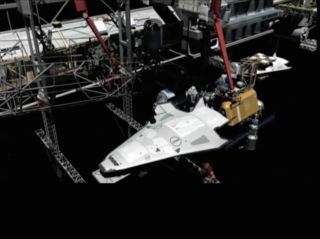 The key to making all of this happen therefore lies in advanced space robotics — "robotic arms very much like the one that was used to build the International Space Station, but with greater levels of automation and safety," Melroy said. "DARPA is building just such a robotic arm," she added. "We think this is a critical capability to building a transportation hub that allows transporation to and from the Earth's surface, from low-Earth orbit to GEO, and even beyond Earth orbit."